A lone astronomer spies a massive object in space hurtling towards earth at a pace defying the laws of known physics. When word finally gets out to the public, an unrivaled panic clenches the world's leaders - and global chaos unfolds. 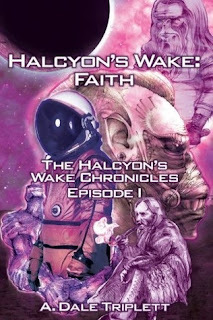 When Halcyon finally arrives, and it doesn't act as predicted, military, civilian and scientific leaders aboard the International Space Station are left to try and make sense of the aftermath, and the unexplained events unfolding in Halcyon's wake. I read much more fantasy than science fiction, but I've been curious about this book for awhile. It starts off with a typical, asteroid-is-coming-to-destroy-Earth type of scenario, but doesn't stay typical for long! The main POV, Zack Dalton, is a cool guy with lots of training, a Marine and astronaut who escapes to the International Space Station with a small group of VIPs. After a couple of months, they have to evacuate the space station and Zack is pulled down the proverbial rabbit hole. This story gave me so many great moments. It's reminiscent of Hitchhiker's Guide to the Galaxy, with a bit of Unsolved Mysteries thrown in. Zack and his party find out there's much more to Earth than any of them previously assumed, and inhabitants who had been dormant or in hiding come out in our planet's perilous time of need. I'm a sucker for the supernatural, and I just smiled bigger and bigger as more such elements were piled in. It's safe to say, I'm looking forward to the sequel. I had a lot of questions left unanswered, and the ending felt too abrupt, but being book one of a series, I'm assuming more explanations will unfold in detail later. In the latter half of the book a few point of view characters are added who don't have their own story arcs. They give additional glimpses about what's going on, and what Zack will have to face (presumably in the next book), but it felt like a less-than-elegant way to handle these reveals. Despite that, I enjoyed this story immensely. Triplett pulls off an unbelievable story progression with an authentic level of detail. It's written in first person past tense from Zack's point of view. The additional POV characters are in third person past tense. I would describe this as science fiction with fantasy elements. Although it could be science fantasy if the remainder of the series continues heavier in the fantasy direction. The potential for that is certainly established, but there's no telling where this ride will take us next. You can find it here on Amazon or here on Goodreads.